How to Drop a Feeding. 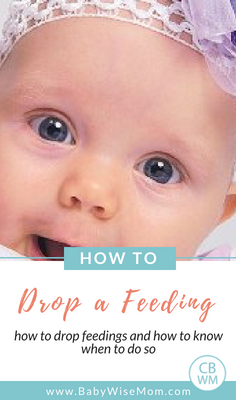 How to know when to drop one of your baby’s feedings and how to go about doing it. When you drop a feeding, you don’t decrease the amount of food your baby eats. You rearrange it. More gets taken in during fewer feedings. Dropping the middle of the night feeding. This usually happens between weeks seven and nine–though it is perfectly normal to be later! Some babies drop it altogether, while others gradually stretch it out. By this I mean your baby was eating at 2 AM. Then moves toward 3 AM, etc. If you have a “stretcher,” see this post: Early Morning Feedings Before Waketime. There are some who don’t go by the book. Don’t worry if your child is one of these. It doesn’t mean you are doing anything wrong or that you are a bad mom or that your baby is difficult. It just means your baby is one of those babies described in Babywise: “not all babies go by the book” (page 124). See the Early Morning Feedings Before Waketime for strategies on helping your child drop this feeding. Extending your routine. This is moving to a 3.5 or 4 hour routine. In this case, a daytime feeding will usually be dropped. Baby is usually ready to move to a 3-4 hour routine between three and four months, but there is no rush to get there. For more on this, see: When to Move to a 4 hour Schedule. You can also read Baby Whisperer: Four Hour Schedule. I have listed these in the order they should be dropped. First, the middle of the night. Then the “dreamfeed.” Finally, you drop daytime feeds as you extend the schedule. Be sure your baby is ready to do these things–don’t force it. If you wonder what ages your child should be doing things, be sure to see: Babywise Milestones or Your Babywise Baby: First Year Overview. Emily, I would just go back to 1 unless she eats so terribly today that you need to offer her a bit more. That is good advice for dropping the night feeding. I have an unrelated question mainly because the situation is happening right now. Did your son ever refuse to come out of “time-out”? We just had a situation where our 20 month old wanted something..dad said “no” and he threw a fit. So..into the corner he went for a time-out. After a minute or two, my husband called him out of the corner but he absolutely REFUSES to leave. Even if we go up and try to take him out ourselves, he resists us and pulls away. He will stay there and cry until he’s tired and eventually gives up..but we’re talking more than 5-10 minutes here. We’re not sure if we should just let him stay there until he’s ready to come out or if we give in and pull him out. I wasn’t prepared for this to happen. Most kids don’t LIKE being in timeout! He doesn’t do this all the time…only once in awhile. He’ll cry almost the entire time, occasionally stopping to hear us. If we call him when he stops crying, he starts up again. It’s almost like he’s saying “I’m going to show you how much you hurt me!” or “how much I’m upset”. I know that’s not really what he’s thinking but it sure seems that way sometimes. He has a very stubborn, smart & independent personality. If you have any past blog posts that relate, would you please direct me? Thanks! A quick update on our timeout situation…30 minutes LATER…hubby tried to pull our son out of timeout. He pushed/ pulled away from him, screamed louder, refused to calm down or make eye contact. So hubby isolated him (in crib by himself w/no blankets, toys,etc.) He cried hard for a minute more and then hubby went back into the room and asked “Are you all finished?” Our son “signed” “All finished!” and immediately stopped crying. Granted, hubby asked him this same question while he was standing in the corner and our son refused to answer or stop crying. Weird eh? Like I said, this doesn’t happen often but it’s happened more than once. Any thoughts? Thanks! Emily,The age range to move to 10-12 hours straight is 16-24 weeks. But do note that it is 10-12 hours. Brayden has never slept 12 hours at night. Here are a couple of posts for you to review:Early Morning Feedings Before Waketime: http://babywisemom.blogspot.com/2008/01/early-morning-feedings-before-waketime.htmlNighttime Sleep Issues: http://babywisemom.blogspot.com/2008/01/nightime-sleep-issues.htmlI don’t think you are necessarily having a problem, but reading these might give you an idea of what to watch for when your baby is ready to not eat in the night. Denise,That is strange. It is hard for me to say without knowing his personality and the reasons for the time out and discipline history. One thing I would make sure of is that time out is the optimal discipline method for him. If it isn’t, find something else.For the time out, I think I would have left him there if he wanted to “mope”, but return every so often to invite him back to the family. It sounds like he is emotionally upset. Here are some posts to look through. Get To Know Your Child’s Personality: http://babywisemom.blogspot.com/2008/02/get-to-know-your-childs-personality.htmlTantrums and Discipline: http://babywisemom.blogspot.com/2008/02/tantrums.htmlLove and Logic Book : http://babywisemom.blogspot.com/2008/03/love-and-logic-book.htmlhttp://babywisemom.blogspot.com/2008/03/love-languages-not-babywise.htmlGood luck! I found 18-20 months to be the hardest with Brayden. I have a question, and I’m hoping you can help. Claire is 10 weeks old. We had been, until last week, on a great schedule. We were feeding at 7 a.m., nap from 9-10, feeding at 10:30, nap from 12-2, feeding at 2:30, nap from 4-5, and feeding at 6:30, with bed at 7. We would do a last feeding (dreamfeed) at 10:30. Claire was working towards sleeping through the night, with wakeup at 4:30ish, sometimes pushing to 5:30. However, starting last week, she began waking at 1 a.m. or 3:30 a.m. and needing feedings. When she woke at 5:30 or 6:30, she was then unable to wait for her 7 a.m. bottle. We tried increasing the amount of feedings at each daytime feed to a full 5-6 ounces, but she won’t always take that much, no matter how hard we try to convince her. In addition, she is taking a VERY small dreamfeed, because she is too sleepy. We have tried waking her, or changing her diaper in the middle, but we cannot get her to take a full feeding at that hour. As a result, her napping is off schedule, and I feel like I’ve lost all control. Can you suggest anything to get her back on track, and to convince me that we haven’t reverted all the way back to a newborn schedule? I thought we were making progress. Now, I’m at my wits end. My firstborn daughter was a textbook baby – no problems…I felt proud. My second child started sleeping 7 hours consistently at night by 7 weeks. He is now almost 7 months old and still only sleeping 7 hour. By now he should be doing 10-12! He isn’t hungry enough in the day to keep the schedule 3-3.5 hrs, so I’m feeding him every 4 hours (8am, 12, 4, 8) So, he wakes up usually at 4:00 am and eats pretty fervently and goes right back to sleep. Sometimes he even wakes up at 2 and 5!! I don’t know where I went wrong. It’s possible I’ve been too flexible with him, not always starting him at the same time for the morning feed…but usually within 30 minutes to an hour and then the next feeds shift a little so that by afternoon I’m on track. I read a bunch of the blogs but none have to do with a 7 month old. Crying it out is much harder now. Should I just decrease the time that I feed him each night so that he eventually gets used to not eating much during those middle of the night feedings? I saw that as one of the suggestions in the blogs. Maybe my situation isn’t all that unique but I feel like it is cause he’s 7 months and is having the problems that a 3 month baby would be transitioning through. One more thing on my previous blog…when I feed him for his last feeding at 8:00 he won’t go to sleep. He’ll cry till 10:00, so now I just let him stay awake till 10:00 and then put him down. That’s been working so far, but I don’t know if I am conceding to his terms…am I being a softie? Hi, I just discovered your blog and I love it. My first baby is 3 months old and I really want to do Babywise with her but I am struggling! I have tons of questions, but for now I’ll just start with one:When my baby has her last Eat/Awake/Sleep cycle of the day, this means she is basically waking up from her last nap and then being changed and fed and put down for bedtime. Is this correct? I’m so worried that letting her nap so close to bedtime will ruin her sleep! Previously she’s been going to sleep between 7:30&8pm, sleeping until about 5am (with a few bouts of night crying, but no feedings), and then returning to sleep until about 7am. I’ve never done a dreamfeed because she always seemed too difficult to rouse, but should I try to start one now at 3 months? Or somehow just focus on getting rid of the 5:30am feeding? Help! I first read Babywise when I was pregnant and it seemed so simple. Trying to implement it is so much harder than I thought! Hi Jane,It is possible she is waking in the night because of not taking in a full feeding for the dreamfeed. It is also possible that she is in a growth spurt and just not able to take enough in one feeding. She might need more frequent feedings in the day.Things will go back to normal–don’t lose heart! Be sure to check out the blog index and look through the sleep issues and nap sections. Good luck! Jamie,It should be fine to do feed, change, bed if your baby is doing fine with it. Most babies go to bed for the night somewhere around 7-8:30 anyway. Once your baby hits 4 months, he will likely be ready to drop a nap and not nap so close to bed. I wouldn’t start a dreamfeed at this point. I would just leave it as is. Evaluate that 5:30 AM feed to decide when to drop it. See this post for more on that:Early Morning Feedings Before Waketime: http://babywisemom.blogspot.com/2008/01/early-morning-feedings-before-waketime.htmlHang in there! It is a lot of work, but it makes for less work for you as your baby turns into a toddler and child. Thank you Valerie! I actually decided to drop the DF last night and I put him to bed around 8:15 instead of 7:30 and he slept till 7 a.m. (his established waketime)! I’m hoping that he’ll be consistent but I was quite pleased with the results…Here’s my next question. How do you “shift bedtime back”? He takes 3 naps generally and his last nap ends usually around 4:30 p.m, give or take 30 minutes. So last night I kept him up till after 7:00 and I was REALLY pushing it. I don’t want to encourage a fourth nap but is that how you do it? Or do I try to have him nap till 5:00 so that he can stay up a little later? I’m a little confused on how to do that since he is used to a waketime of only 1.5 hours during the day and about 2 hours right before bed. How do you adjust his metabolic clock?? I don’t think he’s ready for a four hour schedule although we may be getting close? ?Thank you!! See this post for ideas on that:Time Change Strategies: http://babywisemom.blogspot.com/2008/02/time-change-strategies.htmlBut don’t be affraid to try to have an earlier bedtime. Who knows, he might sleep for 12 hours? I have a question about a friend’s baby. He is a babywise baby, he is 6 months old and sleeping through the night. He is breastfed but still on a 2 – 2.5 hour schedule. It seems strange that he is on essentially a newborn schedule but he is 6 months old. When he was 4 months old she tried moving him to a 3 or 3.5 hour schedule and she said it threw everything off and that’s when she moved back down to the 2 hour schedule. I was just wondering if you have any advice, tips or tricks that I can pass on to my friend? Thanks. I would say if that is what her baby needs, to do that. Is he on solids yet? That can really help lengthen out the schedule, but often only once all foods are introduced and he is eating a full menu each day. If he is an active baby with a fast metabolism, this isn’t that odd. My son was the same way. He got there, but was older. I need help. My 7.5 month old 3rd child is really having a hard time with sleeping at night. I followed baby wise with my older 2 and it worked like a dream. This third one is so tricky. With the older 2’s activities and school schedules I was not able to really stick to a consistent nap routine until this summer when things calmed down. Well, she has adjusted very easily to a daytime nap schedule over the last 3 months, but her nighttime sleep has not improved at all. She is 7.5 months old. She will only sleep 7 hours no matter what I do. She takes a great morning nap of 1.5-2 hours and also a 1.5-2 hour afternoon nap usually around 12:30-2:30. She takes a short (45 min-1 hour) evening nap around 4-5 and then is definitely ready for bed by 7-7:30. This is the problem. She will only sleep 7 hours so that leaves me with a 2-2:30 am wake up. I always let her fuss for at least 10 minutes before I go in. She rarely settles back in and cannot be comforted unless she is fed. She then will sleep until around 6, but sometimes she is up again acting hungry around 5. Should I add a dream feed at 10-11? She seems old to start this. This always seemed to disrupt my older ones. I am hesitant to create a bad habit, but we need the sleep. She is breastfed but also eats solids well 3 times a day. I have been very careful about making sure she gets stuffed at every feeding. She just seems too old to be waking at night. Help! See this:Nighttime Sleep Issues: http://babywisemom.blogspot.com/2008/01/nightime-sleep-issues.htmland 5-8 Month Sleep Disruptions : http://babywisemom.blogspot.com/2008/05/6-month-sleep-disruptions.htmlYou might end up needing to CIO at night. Good luck! My 4-week-old is currently on a 3 hour schedule, eating at 7am, 10am, 1pm, 4pm, 7pm, 10pm then as he wants during the night. Right now he is getting 7-8 feedings a day–he used to wake up consistently twice during the night, around 1am and 4am, to eat. Now he is starting to have more nights where he either doesn’t wake up till 3-4am or I am having to wake him around 4am (since he’s not supposed to sleep more than 5 hours until 5 wks according to BW). Then he doesn’t wake up again until 6:30-7ish, so I just make that his first feeding of the day if it’s close enough to 7. In BW it talks about having 8-10 feedings until 8 wks, then 7-8 until 12 wks I believe. My concern is when my baby starts sleeping through the night, he will be dropping 2 nighttime feedings, not just 1. Is this okay? Should I change his daytime schedule? Right now he is showing he’s getting enough–plenty of wet/poopy diapers and gaining about 1 lb a week. BW says After 8 weeks old, your baby might be able to move to 6 feedings in 24 hours. Starting at 13 weeks, your baby should be at 5-7 feedings a day. I would doubt that he will go down to 6 feedings before 8 weeks. If so and you find that he starts to change his growth patterns or diaper tendancies, you can drop to a 2.5 hour schedule to add a daytime feeding. I have a question for you. My son likes his 12am and 4am feeding. He will eat about 4-5 oz at each. he is 2 1/2 months old. he does not eat more than 2oz at 9am. Any thoughts. When can i start dropping the 4am feeding??? Thank you for your help!! From what you have told me, it sounds like you could start weaning the 4 am feeding. 5 hours is a long time to go and still not be hungry, so I would start to drop it. But you might then need to move your 9am feeding up because 9 hours might be too long for him at this age. Due to stress related high blood pressure, my dr has advised me to try to get as much sleep as possible during the night, so I am pumping BM for my husband to give my 2 wk old after I go to bed. I would like to establish a 7:30, 10:00, 1:00, 3:30, 6:00, 8:30 routine (this is what I did w/ my first son). Do I have my husband feed at 11:00 or 11:30, or do an earlier dreamfeed (like 10:30)? Also, he has been waking up about 1 hr after my husband puts him back to sleep and is showing definite hunger cues. Do I go ahead and feed him or try to make him CIO? Any advice would be helpful. Thanks! Libbi, do whatever is best for your DH. If he is up until after 11:30 anyway, that is fine. If not, 10:30 or 11:00 is fine too. If he is waking hungry, always feed him. Hi…I have a question because I think I have messed everything up! We were on a beautiful schedule (7, 10, 1, 4, 7, 10), but I felt like I was having to wake my 11 week old every time for feedings so I was going to let him sleep a bit longer and move to a 3.5 hour schedule. Now…naps are all messed up, he wont have a longer wake time, he is fussier, and just plain hungry today (day 4). however, he has slept longer each night (9.75 hours last night rather than the 7.5 on the old schedule). So…today I had to feed him after 2.5 or 3 hours every time, and am wondering if I should go back to the 3 hour schedule with the 10 oclock dream feed or is it too long to feed him at 7 and expect him to go to bed at 8 and not get more food until 7 the next morning? It seems kinda long. Another note…he is 15 lbs 4 oz. at 11.5 weeks. Thanks so much! I have a 4.5 mo old that has been a textbook baby from the beginning. She has been STN since 6wks. She now sleeps 10+ hours at night with no dreamfeed consistantly. She is a very happy baby and very laid back.Recently she is starting to have issues with her naps being short (i.e. 40-50minutes) or intermittantly not napping at all (just lays in her crib) when she usually has taken 1 to 2 hour naps until now. She has never been 100% consistant with nap length, but usually not under an hour.Until this week her schedule generally was as follows:6:30 – wake up/nurse8:00 – Nap 19:30 – wake up/nurse11:00 – Nap 212:30 – wake up/nurse2:00 – Nap 33:30 – wake up/nurse5:15 – Nap 4 (for 30min or so)6:00 – nurse8:00 – nurse/sleep for the night This week I have tried to put her down for a 4th nap since the others were short, but she just cries…and I am not sure if she is crying because she doesn't need that nap anymore or she is overtired. She has never cried when being put down for naps or night time EVER. I still have had her on a 3 hour schedule since she has not shown signs of needing to change, but I am wondering if it is time to make some adjustments. Even with the short naps she is generally a happy baby. I am not sure what my next step should be? Do I need to drop her 4th nap and/or change her to a 4 hour schedule? Based on the example schedule I gave you and her age what reccommendations would you give for feeding changes and nap changes? She is at an age to drop the fourth nap. See the label "dropping naps" for more on that. She might have been experiencing the 19 week developmental leap described in the Wonder Weeks (see blog label "wonder weeks"). She might need her waketime length adjusted to be a bit longer. Hi, I read your blog EVERY day!! It is such a great source for answers and re-assurance as a first time mom it is just great. I desperately need your thoughts – our son is 12 weeks old this week, has been doing BW since birth on a 3hr routine and STTN since 6 weeks – he is bottlefed and is 6kg (the ideal weight for his age). Basically since week 10 he has been waking up between 3am – 5am starving for a feed – this was because for some reason he started taking less feeds in the day. so we have moved to a 3.5hr schedule this week 6am, 9.30am, 1pm, 4pm, 7.40pm and dreamfeed at 11pm. He has adjusted ok to the new schedule although he is still adjusting to the mid afternoon sleep. I am really concered about the waking for a feed during the early morning. since on the 3.5hr schedule he does drink more at each feed but I feel like I am forcing him to drink the last bits each time. We have tried CIO for a couple of nights, but he wakes every 20min – 30min and has a loud cry and then sleeps and this goes on until I give him the bottle. Once he is fed, he is asleep in minutes!! I had thought growth spurt, but one that lasts 2 weeks, and he is not consistently waking every night, more like every 2nd night. Please, please, please do you have any suggestions at all?? I need to sleep!Thnaks so much for your help! oh I meant to say that when we were on the 3hr schedule he started almost refusing feeds – so instead of taking 150mls he was only taking 60mls and snacking. By moving to the 3.5hr schedule he takes between 150mls and 180mls – but this does not seem enough. Sharyn, since he is hungry, there isn't much you can do. If he is hungry, he needs to eat. So long as he is hungry at that time, I would feed him. Once he starts not being hungry, you can try CIO, but CIO won't work if he is hungry. Hang in there! Amilia,if it were me, I would either:1-go back to a 3 hour schedule2-wait to drop the DF until baby could do a full 4 hour schedule3-He might be able to go more than 12 hours between feeds. If so, you can pump before you go to bed so you don't go more than 12 hours. My son is now 7 weeks old, and my wife and I are trying to drop the nighttime feedings. We are typically on a 3,6,9,12,3 etc schedule for his feedings. He has built up a tendency of skipping the midnight feeding then waking up on his own somewhere between 2 am and 3:30. Unfortunately, in this process he seems to have started having irregular feeding times at other times during the day or wakes up from naps before feedings should commence. We have treated it as the 45 minute intruder, but this has lasted over a week.We are concerned that these wake ups may be as a result of a changing feeding scheduleMy questions are: (1)Are we correctly dropping the feedings by letting him sleep till he wakes on his own? (2)Are his odd wakeup times due to a messed up schedule?Please, any suggestions will help. Innuendo, So are you starting your day officially at 6 AM? I have a couple of suggestions:1-Have a dreamfeed somewhere around10-11 PM.2-let baby sleep until he wakes up.3-start the day at the same time each day even if he ate recently in the night. So say he wakes at 5 to eat. You normally start your day at 7. Get him up at 7. But you can fluctuate within 30 minutes total, so you could do 7-7:30 or 6:45-7:15 etc. SheriThe trick is that you should be having theem in bed at 7/8 instead of a nap. I would do closer to 8 since you wake at 8. But if they need to go to bed sooner, that is okay. McKenna sleeps 12.5 hours at night. I would do the bottle and solids at dinner, then just give them a bottle again just before bed and let them sleep right on until morning. By 5 weeks (and thus now by 6), you can stop waking baby in the night. I would let him sleep. You don't really want more than 8 hours to go by right now. So if he consistently starts sleeping past 5:30, you might consider waking him until he is about 8 weeks or so.There is a post titled "babywise milestones" that should give you some guidance. Hi!I have a 6 week old on a 3 hour schedule beginning at 6:30am. We used to do a 12:30 and 3:30am feeding but want to start working toward dropping the middle of the night feeding. What is the dreamfeed? Is that an extra feeding between 10-11pm? Because we've pushed th 9:30pm to 10 as a dreamfeed and let her wake up on her own but she still wakes at like 2am and 4:am- It almost seems like we're dropping 2 feedings! Help! I need help in determining how to drop a feeding either 5am or DF for my 4.5 month old son. He goes to sleep for naps/nightime beautifully – rarely cries and never asleep when I put him in the crib. He never really screams to eat at 5:30am but he's noisy enough I can't let him start crying as my daughter is close by and don't want to disturb her sleep since she has school. But he eats a good amount at that feeding and I'm afraid it's starting to affect his "breakfast" at 8am.8am waketime: nurse9:30-11/11:30: nap 111:30: nurse1pm-2:30: nap 22:30 nurse3:45-4:30: nap 34:45: nurse "snack"6:30/6:45 bottle of formula *very very hungry at this feeding (I pump a little later to build a stash)7pm bedtime 11:15pm I wake him for DF5:30am he wakes to nurse (eats for a good 15 minutes)8am waketime (sometimes I wake him sometimes he's up 7:30 – hard to say)How do I start? I'd love to lose that 5:30am feeding…but need his waketime to be as close to 8am as possible to get other kids ready for school, etc. jenpeter13,The dreamfeed is between 10-11. I would probably feed her at 2, then see if you can get her to go back to sleep without eating at 4. That is only two hours later, so she shouldn't need to eat in two hours.But also check out the "nighttime sleep issues" post to give you ideas on why she might be waking two hours later. Sales,I would just stop feeding the dreamfeed and see what happens. Since you want the 8 AM waketime, that is why I would go for the dreamfeed first. See the blog label "dreamfeed" for more help on that.Oh, and take not that since waketime is at 8 AM, there is a good chance he will need an 8 PM bedtime rather than 7. Some babies (like McKenna) will sleep 13 hours at night, but most are 10-12. Kelly, It is MUCH too young to be at 4 feeds a day. I would definitely recommend you add a 10/10:30 PM feed in there–even if he keeps the 1 AM feed when you do so. There is risk of compromising milk supply going to that few feeds so soon, and of course risk to baby's growth. So I would start a "dreamfeed" (see blog label for more on that). Hello, I have 2 questions I was hoping you could answer for me. I have a baby boy, Landon who is 7 weeks old and I've got him on a 3-hr schedule (and have for quite awhile). I feed him at 7:30am, 10:30, 1:30, 4:30, 7:30 then put him to bed, and then he usually wakes up twice in the night to eat. (No dreamfeed. At each interval I feed him, let him stay awake for an hour (including feeding) then try to have him nap inbetween feedings for 2 hours (which doesn't always happen) 1. I find that if he did go down properly a nap, I ALWAYS have to wake him up for his next feeding, and I feel like he never seems very hungry at the 3 hour mark, and it takes him a really long time to eat (sometimes the entire 'waketime' hour, but usually at least 30-50 mins). He usually eats about 3 1/2 ounces of formula per feeding. I'm just thinking that I'm feeding him too often, and I really think that he could easily do a 3.5 hour schedule, if not even 4 hours. (I especially hate waking him from a good nap, as sometimes it's hard to get him to go down!!!) I just know you're not supposed go to a longer schedule until 3-4 months old, and I'm worried if I do stretch out his feedings he'll need more night feedings. What do you think?2. I also had a question about naps. We've been putting Landon to sleep at night and for naps drowsy but awake for a little while now. He does pretty good at night usually and generally even goes 5-6 hours for his first stretch of sleep. However, during the day he will sometimes cry for his entire 2 hours naps (usually at LEAST 2 whole naps a day). I'm just confused as to whether I should be consistent and let him cry out all of his day time naps, as I do at night, (I do the progressive waiting approach, checking on him every 5,10,15 mins) or should I soothe him for some of his daytime naps to protect his sleep? (He will NOT sleep in a swing, he hates it). I'm just worried if I 'rescue' him from some of his naps he will learn that if he cries long enough I will come, and the inconsistency will confuse him. I also don't want him to lose so much of his day time sleep though…. Please help me, thank you soooo much! Amanda, If you look at my Babywise Milestones post, you will see that he is old enough for a 3/3.5 combo schedule, so if he has a time of day that he consistently is not hungry after 3 hours, you can do 3.5 for that stretch. For naps, I would not let him cry for the entire nap. At his age, him sleeping is the most important (see "Newborn Sleep Hierarchy"). But also really try to solve why he won't fall asleep at those naps. Good luck! Do you have any past articles or can you post one regarding transitioning a baby to three meals? My 7 month old is on four bottles plus rice and baby food and is a big eater. I am afraid of dropping that 4th feeding…any tips? Mel, I do have a post on dropping the fourth feeding. I don't drop the fourth until 12 months old. Since you do bottles, you could probably try it around 10 months IF he is ready. If not, there is no reason to stop that fourth feeding. Hi Val. Your blog is a godsend. It helped tremendously with my firstborn daughter who did great with bw. I just had my second (a boy)and he is 6 weeks old right now. He doing 8 feedings a day with cluster in the evenings, a df at 10:30, and one night waking around 4am. I am trying to plan ahead for the next few weeks. I know you said that cluster feedings should be dropped around 8 weeks. If he still is waking at night at 8 weeks, should I drop the one cluster feeding? If he is not waking at night, should I drop the cluster feeding and go straight from 8 to 6 feedings? It seems like a big drop to go from 8 to 6 feedings at once. Thanks! I wanted to add one more thing- I'm having a really hard time waking him up enough to get a full feeding at 10:30 for his df. His last feeding is at 8:30 (because my husband gets home late from work and I want him to give him a pumped bottle). Is there just not enough time between the last feed and df for him to be hungry enough to eat? Should I stop the cluster feeding now to make him more ready to eat at the df, since that's the more important feed? Hello! Your blog has been a tremendous help in implementing BW. THANK YOU! Not sure if you're still answering questions to old posts but here's my question: I have a 4mo old and trying to figure out next steps to drop his dreamfeed and get him to 5 then 4 feedings schedule. I currently have him on a 3-hr, 6 feedings schedule, although previously he was on a 3/3.5 combo but waking up around 5-6a for first feeding. After reading your post I scaled back to 3 hours and voila he started sleeping longer. His schedule starts at 7am, feedings every 3 hours, a df around 930pm, and now sleeps 10-11 hours at night. I have moved the df little by little from 11pm to 900-930–should I concurrently extend his schedule to 3.5 hours so his last feeding isn't at 7pm or should he be fine? Another issue in having is he doesn't nap for every nap–at least not the 1.5 hours because he's not sleepy enough as he used to be after 1.5 hrs of waketime, so I feel he def needs to drop feedings. What would be your recommended next steps? Should his new schedule only have 3 naps as I've read on other blogs? Thx in advance! Update: last night I moved his df up by 30 mins to 9p and he did NOT sleep well. He sucked on his pacifier or hands all night and woke up before 5am wanting to eat. I am second guessing if he's really ready to drop it. However, the 3 hr nap schedule isn't really working for him because of his lengthened waketime. Should I tweak his day schedule and keep the dreamfeed? Hello! Thanks for your blog – I have found it very helpful! I have a question and I am sorry if it is answered elsewhere..I couldn't find it so please point me in the right direction if it is.My boy is 6 weeks old and I am starting to think about dropping his 3:30am feed but I am struggling with knowing how because of how he takes his late night feeds. Currently our schedule is this -3:30am – he wakes for this and feeds fairly well6:30am – we sometimes have to wake him but he doesn't feed great9:00am – feeds good12:00pm – feeds good3:00pm – feeds good5:00pm – long feed (these are close as I found he never slept between them so we go for a walk in the pram so he can catnap and then we feed when we get back)8:00pm – very sleepy but I get a decent feeding out of him by doing things to keep him awake10:30pm – he is not interested in the slightest. Usually I can get him to feed for 5-10min but last night he wouldn't take anything. So he slept from his 8:30pm feeding to 3:30am without eating.I would love to keep the 10:30 feed mad drop the 3:30 feed eventually but I can't see how this will happen with him not eating at 10:30? What should I do? I know it could be a little while before he drops the 3:30 but I am thinking about it now. He weighed 3.8kg at birth and now weighs about 5.5kg so he is a decent size and putting on weight well.I would really appreciate your help. Thank you!!!! Help 🙁 my son is 19 weeks. He is a super happy BW baby. We have done fulll feedings and eat wake sleep since birth. He's much more alert and happy than babies his age and we love it. He goes down great for naps but we battled with the45 min intruder forever. Finally I'd had enough, a friend suggested the book 12 hours sleep by 12 weeks (he was almost 12 weeks at the time) which suggested moving him to a 4 hour schedule. He had never cried for food before on a 3 hour schedule so we switched to a 3.5 and in a matter of days to a 4 hour schedule and he happily handled the wake time and BOOM 2 hour fifteen min naps and a catnap in the afternoon. Wonderful. Before he had been up every 3 hours at night and suddenly he was waking once around 2 am then back to sleep. Up once in 12 hours is great for me if not battling the intruder and on this wonderful predictable schedule. He takes 8oz of breastmilk at each feeding so I think he's plenty able to go 12 hours without eating but I want to be sure before dropping it and doing cry it out. Advice? (This week he had shots, is teething and going through the 4 month regression so he has been up several times and the intruder even made an appearance for 2 naps. I can't handle that so I know I need to CIO but want to make sure he can drop the feeding. He SCREAMS bloody murder at night the one time we tried CIO. Idk if that's normal. He literally never cries bc he's all smiles so I don't have a good grasp on types of cries. I just didn't know if CIO meant let them scream hard hard no matter how long it takes. Sorry for the novel. Any advice is appreciated. Sorry–wakes 45 min later, he is hungry. Hi, I've been reading your blog while trying to do Babywise with our first baby, and had a question about night feedings. Our 2 month old baby girl struggles with colic between 7-9 pm every evening, and so our three hour schedule has her feeding at 6:30, then trying to get her to sleep somewhere between 7-9, and then doing a dreamfeed at 9:30 pm. However, most nights she doesn't go to sleep during that time due to the colic, and therefore the 9:30 feeding is just a normal feeding before she goes to sleep finally. On the nights that she doesn't go to sleep between 7-9, she then proceeds to wake up every 3 (or even 2.5 or 2 hours) all night when before the colic hit full force, she was sleeping 5-6 hours in a row and only waking once for a feeding. How do I go about dropping a night feeding (or 2) when she is a sleepy nighttime feeder and doesn't take full feedings at night, and due to the colic, I've been hesitant to wake her fully at night in case she starts up again? Thanks for any help you can offer! You might need to just wait it out until she outgrows the colic. 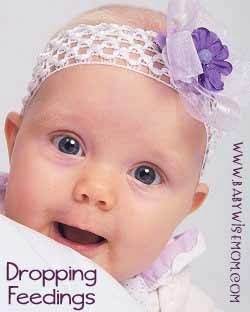 Do you use gripe water and gas drops? Also, are you sure it is colic and not witching hour? If it is witching hour, you can wake her up more to eat without worrying about her staying up. Thank you so much for this blog, it's incredibly helpful! !I have twin 4 week olds that have done BW since day 1 and very naturally took to a 3 hour cycle so we've had 8 feedings a day all along instead of starting at 9. I let them wake naturally at night. They eat at 8 at go to bed, we do a DF at 10:30, and they consistently wake to eat between 2-2:30. They were then waking between 5-5:30 which was perfect for their 8 am wake time, but in the last week they stretched to 6, then to 6:30, then to 7! Don't get me wrong, I love the 5 hours of sleep, but with only an hour between their natural waking and their wake up time, I can hardly get them fed and back down, much less hungry to eat again, even with a 30 min adjustment. They're old enough for the first merge, but we started there so I either drop a feeding, which they seem way too young for, or adjust them to a 2.5 hour cycle during the day and I already have to wake them at 3 hours to eat, so I'm worried I'll be force feeding them at 2.5. I pump and bottle feed them so I could potentially increase their quantity so I know they're receiving adequate amounts if we went to 7 feedings a day, but jumping into that has made me nervous. Thoughts? Hello!I'm a new mom to a 5 week old and we have been trying to implement babywise since week one, but I'm feeling a little overwhelmed with our lack of progress. She is exclusively on formula now after some weight issues and she is still on a 2.5-3 hour schedule all the way through the night. During the day she goes down for naps around an hour after she eats and then it's hit or miss with how long she will stay asleep. My concern is that in keeping with the feed wake sleep schedule I'm feeding her before she is even hungry, just because she woke up early from her nap and refused to go back to sleep! Because of this, our schedule varies every day and she's still waking up every 2.5- 3 hours at night. She is completely healthy and the dr said she can eat less frequently but I'm concerned why she will barely go 3 hours at night. Any advice would be wonderful! I'm feeling a little defeated after trying to do everything "right"Last night she did go from11-3 before eating but she woke up around 2:30 and I just waited to see if she would fall back asleep. She didn't appear to be hungry.